The Milky Way is the galaxy we live in. It contains the Sun and at least one hundred billion other stars. Some modern measurements suggest there may be up to five hundred billion stars in the galaxy. The Milky Way also contains more than a billion solar masses’ worth of free-floating clouds of interstellar gas sprinkled with dust, hundreds of star clusters that contain anywhere from a few hundred to a few million stars each, and probably millions or even billions of planets. 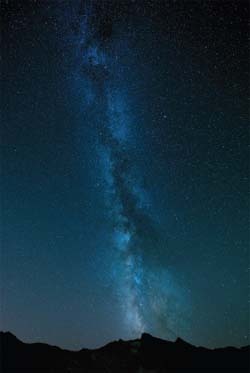 When viewed at night from a location free of clouds or light pollution, the Milky Way resembles a milky spray of light across the sky.